Urban legends are the modern day folklore portraying society’s fears, anxieties, taboos and fascinations with the unknown. A few are real, as some may even contain on an element of truth while others are mere fabrications. Once told in school yards and on city streets, urban legends now found their way onto the Internet instantly becoming known across the global. If these tales were fictional or intended hoaxes, may would accept them as true once posted. I believe this to be the case involving Sheepsquatch, as its ends the urban legend series. Yes, we are discussing Sheepsquatch, which until about a few months ago I knew nothing about. This creature, along with Batsquatch and atmospheric beasts, I only recently became aware off. The existence of Sheepsquatch was revealed while watching a show about American legends and myths. After some time in researching, I discovered the creature was only mentioned on online articles, referenced in a few books and appeared in few paranormal shows. There were even debates about how cryptozologist were skeptical on the idea of Sheepsquatch. This left me questioning if it’s just another fabrication. In researching, the creature is described to be a mammal, about the size of a grizzle bear, covered in all white fur that is why it’s also refereed as “the white thing”. 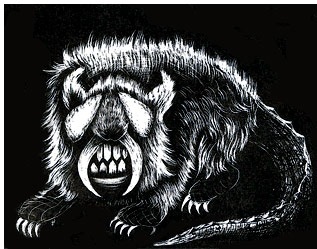 Sheepsquatch’s head is said to be shaped like a dog, long and pointed, with a set of horns resembling those of a goat, along with saber-like teeth. The creature’s front limbs and hands were reported to be raccoon like, yet larger and its tail was hairless and long. There has been conflict on how Sheepsquatch gets around, as some accounts say on all fours while others state it’s bipedal. In most encounters, witnesses claim the smell of sulfur accompanies the creature. The Sheepsquatc”s legend originates from the backwoods of West Virginia in the United States. Sightings occurred in the mid to late 1990s as claimed by trail hikers, hunters and campers. Sheepsquatch is said to be most active in the counties of Boone, Kanawha, and Cutnam. Just to note, these areas also had other reported cases of paranormal activity such as Bigfoot, Mothman, ghosts and UFOs. While researching Sheepsquatch, prior to 2010, the only references I found were postings on the Internet along with a few footnotes in several books. After 2010, the creature’s appearance on a couple of paranormal shows raised its fame along with information about it. Urban legend, cryptid, new species of hominid, alien or Bigfoot’s cousin? I just don’t know. There has not been any new sightings or encounters reported in the last twelve years which only has me believing “the white thing” to be more fiction then real. Yet, if anyone has new information to add here, feel free to contact me. Guiley, Ellen. Monsters of West Virginia. USA: Stackpole Books. 2012. This entry was posted in Cryptids and tagged Cryptids, Monster, Urban Legend on November 9, 2014 by Gatekeeper. Interesting. I’ve never heard of Sheepsquatch before, but there are so many “lesser” cryptids out there that only get a side mention or two. And West Virginia is noted for it’s folklore and legendary creatures. Thanks for the introduction to another! I want to read Monsters of WV. Not directly related, but there’s a great movie about zombie sheep called Black Sheep. Totally worth seeing! If it’s on Netflix, I will check it out.